The Trump administration has successfully ramped up a program that allows the federal government to deputize local law enforcement agencies to identify, process and detain violators of immigration law, but a new audit found that it has done so without much planning or allocation of resources. The number of state and local agencies participating in the 287(g) program has more than doubled under President Trump, who issued an executive order shortly after taking office calling on the Homeland Security Department to boost its use. 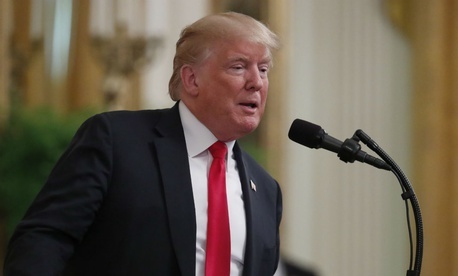 Trump has highlighted the program as a major tenet of his plan to crack down on undocumented immigrants in the United States, including by castigating “sanctuary” cities and states that have refused to cooperate with Immigration and Customs Enforcement in its deportation efforts. ICE employed just 20 program managers for 287(g) as of March 2018, according to a DHS inspector general report released on Monday, which the auditors said was insufficient for handling the dramatic expansion that has occurred since Trump took office. The agency recognized it would need additional staff to accommodate the growing program, but never conducted any needs-based analysis. ICE did not make a request for additional 287(g) staff in its fiscal 2018 budget proposal and instead relied on existing funds to attempt to boost its rolls. Program managers are responsible for overseeing individual agreements with law enforcement agencies, monitoring compliance with their memoranda of understanding, supervising the transfer of immigrants into ICE custody and ensuring proper training for the local officers. The IG found examples of overworked managers, forced to be available 24/7 and unable to take off when they were sick. In order to participate in the 287(g) program, ICE must provide local agencies with certain technology and equipment. In more than half of the cases in fiscal 2017, however, it took ICE more than 200 days to deliver the equipment after signing a memo of understanding. ICE requires local law enforcement officers to complete a four-week in-person initial training session and online refresher courses in order to participate in the program. The agency only offers the training in one location—at the Federal Law Enforcement Training Center in Charleston, S.C.—and it is only available for part of the year, which the IG said is causing delays. ICE also is not monitoring compliance with its requirements for the refresher courses and is failing to revoke officers’ ability to participate in the program after they fall out of compliance. The IG concluded that ICE has no way to determine whether the program is actually helping it complete its mission. ICE agreed to address most of the concerns the IG raised. The 287(g) program was not the first issue at ICE in which staffing realities have prevented the agency from fulfilling Trump’s promises. The president also called on ICE to triple its deportation officers, but actual new hires have declined.